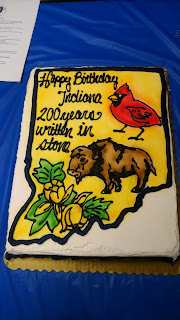 Last night Eric and I went to the Monroe County History Center for the kickoff of the Indiana Bicentennial year (2016) and to say happy birthday to Indiana (Statehood Day is Dec 11 - 199 years). We didn't really know what to expect - I am on their email list and got an email inviting everyone to learn about the events that will be taking place (there was also a call-out in the BEAD newsletter with the same information). So, we went, along with around 50 other people. It wound up being a presentation of mostly the Cemetery Calendar. 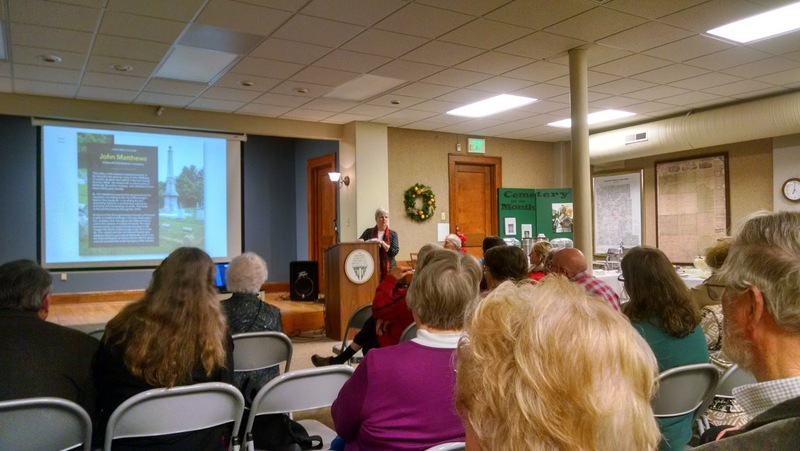 There is a cemetery restoration committee at the history center, and the people on it restore old headstones and do some research in the cemeteries around town (of which there are many). Since we didn't know that this was going to be the main focus of the night, at first I was kind of disappointed and felt bad for dragging Eric along to this event (which I thought was going to be focused on the bicentennial). But it turned out to be really fascinating. The 2016 calendar is more focused on influential and notable people who lived in (and are buried in) Bloomington. It was interesting to hear more about these people, even ones I knew about already, and to see what their gravestones look like. You can pick up your own calendar for $10 at the history center. After about an hour of this, the rest of the history center staff discussed some of the upcoming ideas for next year. As far as I can tell, there is nothing set it stone yet. The most interesting thing I heard was the history center will be offering field trips for anyone interested to go see some of the main venues of our state's history: Corydon (of course, the first state capital), Vincennes (the Indiana Territorial capital and home to Grouseland, William Henry Harrison's home), and Indianapolis (to see the statehouse and the state museum). I will try to keep you updated when I hear more about these and other events. The other cool thing the state of Indiana is doing for the bicentennial is a torch relay across the entire state. You can nominate any Hoosier you think deserves to be a torch bearer here. After all the presentations were done, we got to enjoy some refreshments. 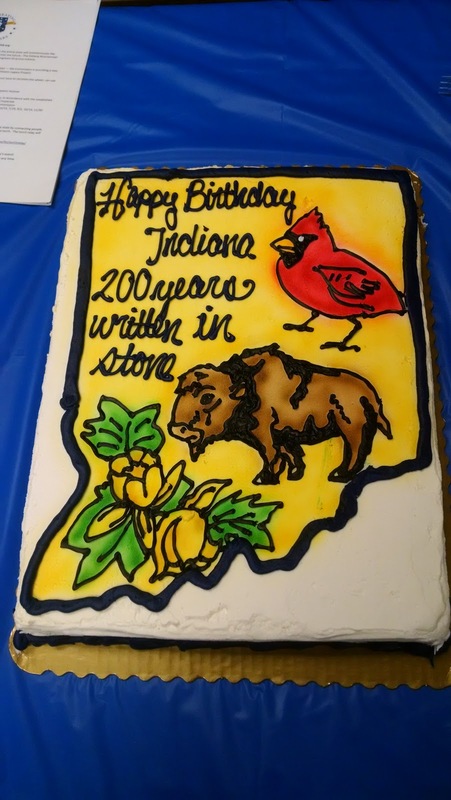 There was a pretty neat-looking cake: "written in stone" is a nod to the limestone industry around the Bloomington area; the cardinal is our state bird; bison were really important in the creation of a Buffalo Trace that became the first road (Falls of the Ohio to Vincennes); and the tulip tree is our state tree. One of the staff at the history center made bison cookies. 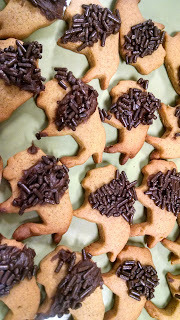 They were really good and also let me make a "bisontennial" joke. There were also bison meatballs that were very tasty. 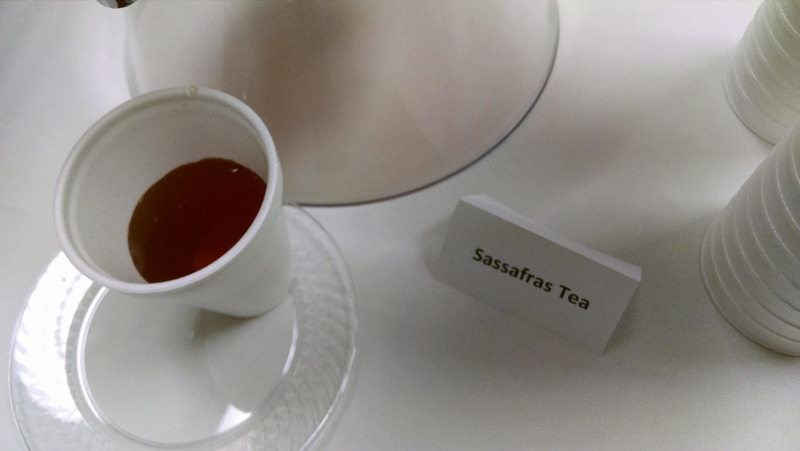 Among other cookies and snacks (goat cheese, Indiana honey, etc) was sassafras tea. I haven't had any in years so this was a nice treat. Sassafras used to be how root beer was flavored. We made the tea once in 4th grade by boiling the bark of the sassafras tree. There should be a lot of cool stuff happening next year for the bicentennial. Next year is also the 100 year birthday of the Indiana State Park system, so we have lots to look forward to!